I have not written like this in a while, but I had to document my reaction to yet one more "NO, THIS is the PROBLEM with Twitter" blog post. What finally set me over the edge was a "reaction to a reaction" blog post by Mack Collier here. His post was a response to Gary Vaynerchuk here. I REALLY can not believe we are hearing the same inter-webs pap for the last TEN YEARS? Yes, ten years of hearing the same complaints, same problems, same same. To Vaynerchuk, I say thee: why invest in something that has ESSENTIALLY been the same "group chat" tool it has been since day one. Sure, there are some ups and downs based on who came and went, or how Twitter helped something some time, or heaven forbid, it was the ONLY place that celebrity posted that thing that time. They can enact some algorithms like Facebook to make it more palatable, less of a firehose, but it was ALWAYS a firehose with ZERO privacy and always noisy, always competitive. Heck, it is the free market of EVERYONE(who uses it) thoughts, ideas, shared blog posts, you name it. The flotsam and jetsam of the internet is on Twitter. The smart folks have always figured out how to discern what they want out of the "cocktail party" that is Twitter. To Collier, I say thee: you don't explain why you use Twitter differently now than it was nearly ten years ago. I assume because you want to market and not have conversations? Otherwise, what does the engagement problem you try to make matter? Know the tool you are using. All of these audience congregators were ever going to be BROADCAST mechanisms even before the rules/paid/etc came along from whichever platform. You give us no reason that "everyone" can't have/find conversation on Twitter. Only YOU find it problematic now, like some barfly that bemoans that his favorite old haunt has introduced "microbrews" and drove all his friends away with a change in the music in the jukebox. Twitter is still what it ALWAYS kinda called itself: a microblog platform. As far as I was always able to discern, they were broadcasting and asynchronous, not some "chatting" platform. You move to the "engagement" portion as if it was relevant to the argument, but what difference does it make? If you found tangible benefit from Twitter, clicks don't matter. As an aside, if you look at the clicks not the impressions, your organic was only TWO less than the paid! 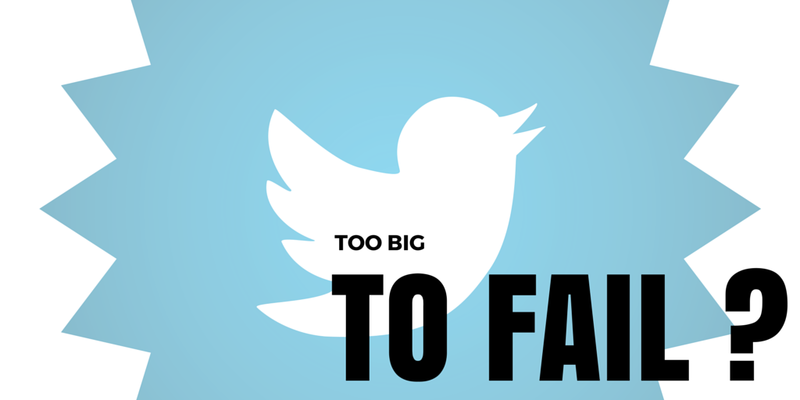 Is Twitter the "social" platform that is "too-big-to-fail?"